Italy was a founding member of the European Coal and Steel Community (ECSC) in 1952, which paved the way for the EU. It joined the Schengen in 1997 and eurozone in 1999, despite not meeting the euro convergence criteria, and its economic/budget performance has remained a source of concern for the single currency area. Italy is the third largest member state (60.6 million) by population, representing 13.6% of all EU citizens (without the UK). Consequently, 76 (10.8%) out of the 705 members of the European Parliament (MEP) are elected in Italy. At the European Parliament (EP) elections in 2014, turnout in Italy was 57.2%, above the EU average of 42.6%. But Italy has become the second most Eurosceptic country, as only 42% of the population perceive the EU as a good thing, while 37% are indifferent and 18% consider it a bad thing, compared to the EU average (62/25/11). Nonetheless, most Italians (63%) do support the euro and a majority feel (59%) they are EU citizens, similar to the UK’s (58%). Italy’s economy, the third biggest in the eurozone with total GDP of €1.7 trillion in 2017, has been struggling since the 1990s and has barely grown since the euro’s introduction. The European Commission’s (EC) autumn forecast and the even more negative winter one paint a bleak picture: Having expanded by just 1% (real GDP) in 2018, it is expected to come to a standstill in 2019 with 0.2% growth. Between 2014-2018, Italy’s economy grew just 0.9% on average annually (real GDP), the lowest in the EU after Greece and less than half the EU average (2.1%). In terms of per capita figures, Italy recorded a real GDP per capita of €28,500 in 2017, slightly above the EU28 average (€27,700). In purchasing power standards (PPS), its per capita GDP has been sliding for more than a decade, standing at 96% of the EU28 average. The unemployment rate stood at 10.3% by the end of 2018 and is expected to stabilise at 10% by 2020, far above the EU28 averages of 7% (2018) and 6.3% (2020). Youth unemployment stood at 31.9% by 2018’s end, double the EU average of 15.6%. After a referendum in 1946 abolished the monarchy, Italy’s 1947 constitution established it as a democratic republic with a bicameral parliament. The most important political figure is the prime minister who is the head of government. The president has more limited powers but sometimes plays a crucial role in the formation of governments. Italy’s governments are characterised by instability and the country has gone through more than 60 since WW2. From the 1990s until 2018, centre-left alliances led by the social democrats and media mogul Silvio Berlusconi’s centre-right coalitions have dominated Italy’s crowded political scene. Italy often failed to carry out needed reforms and came close to needing a financial bailout in the past decade. Berlusconi was forced to resign in 2011 after his centre-right alliance fell apart over austerity measures amidst growing speculation on financial markets. His successor, technocrat Mario Monti (2011-2013), returned economic stability but his austerity drive caused him to lose the elections in 2014. It was the PD compromise candidate Enrico Letta who ruled (2013-2014) over a grand coalition of centre-left, centrist and centre-right political parties. Following an internal power struggle in the PD, he stepped aside in favour of the younger Matteo Renzi (2014-2016). While Renzi pushed through significant economic reforms, his gamble to organise a referendum on constitutional reform to solve governmental instability backfired in 2016. A close aide of his, Paolo Gentiloni, took over as caretaker (2016-2018). PD’s struggles over Renzi’s position split the party and it lost the 2018 elections. The anti-establishment Five Star Movement (M5S) and rightwing populist Lega formed a coalition government after making huge gains campaigning on the dire economic situation and the migrant crisis. After complex negotiations, a populist coalition emerged with the jurist Giuseppe Conte as prime minister. The Lega promised tax cuts while M5S had promised a universal basic income. Their budget proposal was based on optimistic growth projections and almost resulted in EU financial sanctions. But the EU and Italy’s populists eventually compromised, after months of negotiations amidst the “gilets jaunes” protests in France and rising interest rates on Italian government bonds. Lega, led by strongman Matteo Salvini, has since emerged as the dominant political force, having overtaken M5S in the polls. Despite the extreme rhetoric of M5S and Lega on the future of the EU, they downplayed the prospect of an ‘‘Italexit’’. In the meantime, Berlusconi’s political party has dwindled towards insignificance while the PD is struggling to heal its internal divisions. Its newly elected leader Nicola Zingaretti, a socialist, has taken over from the more centrist social liberal wing headed by Renzi, but faces an uphill task of keeping the PD together and establishing it as a strong opposition force. Recent polls indicate that the Lega will become the dominant political force, enjoying the support of some 32.3%, which would translate into 28 MEP seats. The M5S polls at 22.7% and could win 19 seats. However, they have been declining in the polls. While the M5S is part of the Europe of Freedom and Direct Democracy (EFDD) and Lega forms part of the group Europe of Nations and Freedom (ENF), it is unclear which Eurosceptic political camp they will be part of after the EP elections. The PD will likely secure just half (18.9%) of the votes it got (40.8%) in 2014’s EP elections, winning just 16 seats for the Progressive Alliance of Socialists and Democrats (S&D). The PD has regained some momentum since Zingaretti took over and it’s not excluded that it overtakes the M5S, especially if it succeeds in bringing on board smaller left-wing parties or even the liberal-centrist +Europa. Berlusconi’s party Forza Italia (FI) is set for around 9.5% of the vote or 9 seats, for the European People’s Party (EPP). 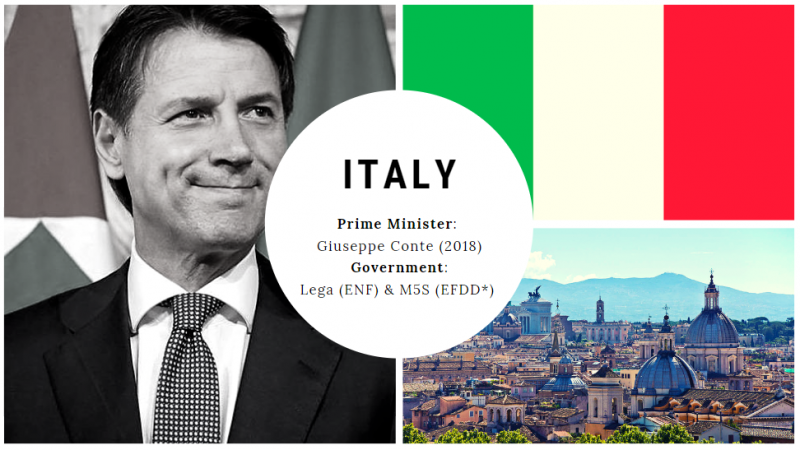 The only other two political parties that may pass the 4% the electoral threshold are the national conservative Fratelli d’Italia (Fdl) and +Europa, which could get four seats each. Overall, these results would be a boon to Eurosceptic groups in the European Parliament and confirm Italy’s image as the most Eurosceptic country in the EU following the UK’s departure. They could allow Lega to bring several eurosceptic groups together in a new parliamentary group. At the same time, a big loss for the national coalition partner M5S could prompt new national elections. Daniel Matthews-Ferrero is a Marie Curie PhD Student in the POLITICO programme at the University of Aberdeen, focusing on contemporary Western European populism. He holds a master’s degree in European Interdisciplinary Studies from the College of Europe.